Plymouth State University came to us with a problem. They needed to increase enrollment by 100 students in less than two months. The task was not insurmountable, but it presented some challenges. The first being that it was February and most prospective students had previously committed to a school. Second, the audience was 17-year-old in state High School students who may have resigned themselves to not attending college in the fall. Third, we did not have data that demonstrated what key messaging worked with our specific audience. We implemented the following campaigns and attained the short-term enrollment goal of 100 students in 6 weeks. 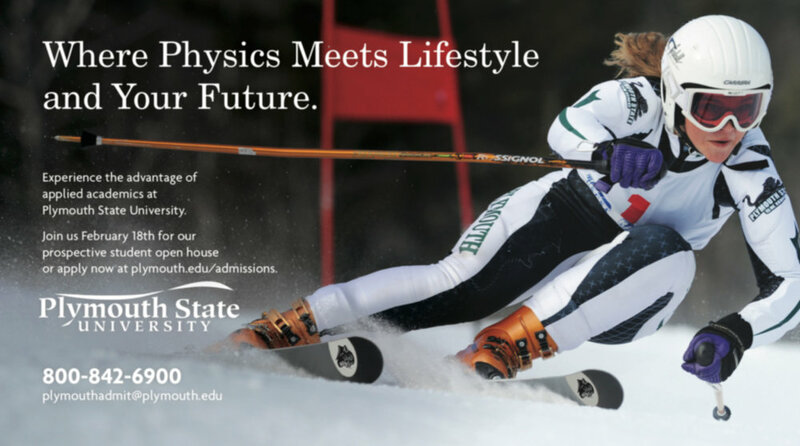 Adventure Sports, Academics and Place - Many undergraduate students choose Plymouth State University because of its proximity to ski areas, rock climbing, hiking and water sports. The concept was to combine lifestyle, academics with the excitement of downhill skiing. Belonging and Future - This campaign spoke to teenagers inherent desire to feel part of something bigger than themselves and to join other like-minded students at a place where they belong. Where Will You Be Next Year? - The idea behind this campaign was to use the "Where were you accepted?" conversations amongst graduating High School seniors as a trigger. We had less than ten days to come up with the concepts, build a marketing strategy, develop creative, negotiate the media buy and implement the campaigns. The timeline was aggressive, but the creative and placement fulfilled the short-term enrollment goal of 100 students in less than six weeks. The following are the marketing channels used and the media results. Radio broadcast - 2.8 Million Impressions 40% within the 17-19-year-old in state demographic.